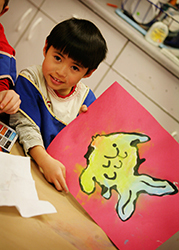 The Rivendell Art curriculum is designed as a project-based, interdisciplinary program. This integrated approach allows for a broad-based scope of learning, while honoring the creative energy of the individual child. A project-based approach is appropriate to hold a child’s attention and inspire creativity through active learning (as opposed to lecture-based learning). We learn by doing! Several projects each semester are designed to follow the school-wide interdisciplinary topic units in social studies and science, allowing for deeper understanding of the content areas. At every level, students are encouraged to use planning, creativity and effort to produce artwork they are truly proud of. Elements and principles of design for the modern artist. Incorporation of art history and theory into project-based learning. At the preschool level, the focus is on manipulation of a variety of tools and materials. Both fine and gross motor skills are developed. Beginning art terms and vocabulary are also introduced at this level. Younger kids expand their skills to a achieve a broader level of expressive ability. For example, now that they can manipulate a pair of scissors, they can create more complicated shapes with them to utilize in their creations. Exploration of different media and techniques, as well as an emphasis on planning and making creative choices in their work, are the focus at this level. Middle kids crave a sense of realism in their work. Drawing and “seeing to draw” is introduced at this level. We also emphasize how artists see and interpret reality in many different ways. By studying, modeling and appreciating a wide variety of artists, students can begin to find their own creative style in their projects. Older kids have a true mastery of materials and concepts, which allows them a great deal of freedom in their expression. We continue to develop drawing skills, adding 3D techniques, such as perspective and shading, as well as proportion and more detail, in our drawings. Projects in clay, mixed media, collage, and multi-step processes offer creative and artistic challenges for this age group.